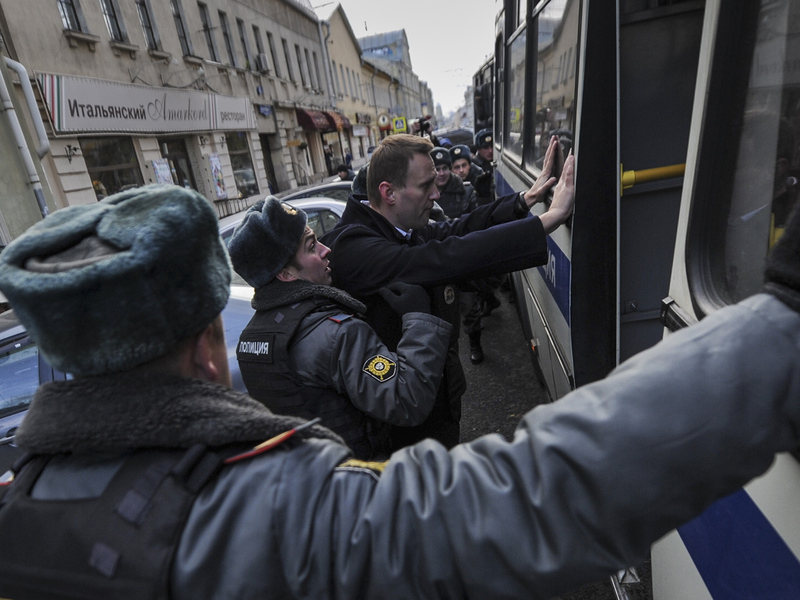 MOSCOW Moscow police on Saturday briefly detained several opposition leaders as well as a dozen other activists while they were protesting against the intensifying crackdown on Russian opposition. Hundreds of people gathered Saturday afternoon outside the headquarters of Russian security agency FSB, a successor to the KGB, and outside the office of the Investigative Committee to protest the crackdown on the opposition as well as the treatment of leftist activist Leonid Razvozzhayev. Anti-corruption campaigner Alexei Navalny as well as Sergei Udaltsov and Ilya Yashin were detained while they were standing in the vicinity of the FSB headquarters with posters saying "I'm against torture and repression". They were released several hours later after they were charged with staging an unsanctioned protest, which carries a fine. A dozen of their supporters, however, were detained outside the police station where the three men had been kept. Elsewhere in Moscow, Brooklyn Nets owner and former Russian presidential candidate Mikhail Prokhorov announced that he's leaving business to focus full-time on politics, returning to the political arena after remaining silent through a five-month Kremlin crackdown on the opposition. The 47-year-old Prokhorov, who is believed to be worth about $13 billion, finished third in Russia's presidential election in March amid speculation that his candidacy was orchestrated by the Kremlin. Though he denied the claim, he was nowhere to be seen as the government launched a crackdown on the opposition this spring, arresting activists and introducing new harsh legislation. Prokhorov appeared Saturday at the first conference of the party he set up several months ago, announcing that he would put his money in a trust fund and let his partners at the investment vehicle Onexim run the shop.